Outside the Discovery Centre on the seafront, piper Ross Hunter led the way and the marchers were met by a further crowd of a hundred or so at the Memorial Stone. 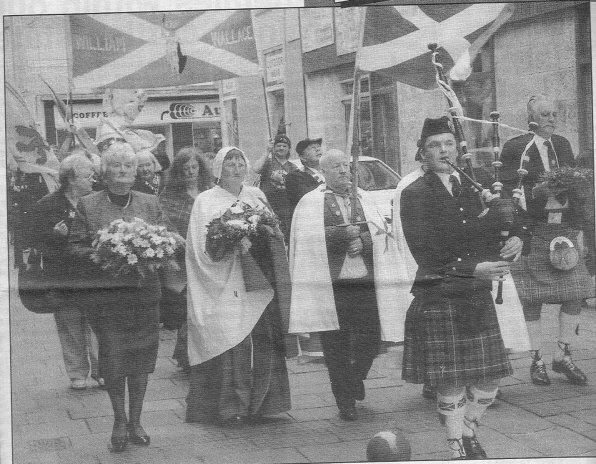 The official ceremony got under way with "Sweet Rothesay Bay" on the pipes to set the tone, after which local councillor Robert Maclntyre welcomed everyone from far and near including those from Falkirk members of the Society of William Wallace and also Harry and Diane McAlister from Seattle, USA. In Honour of the "Men of Bute"
at the Battle of Falkirk, 22nd July 1298. 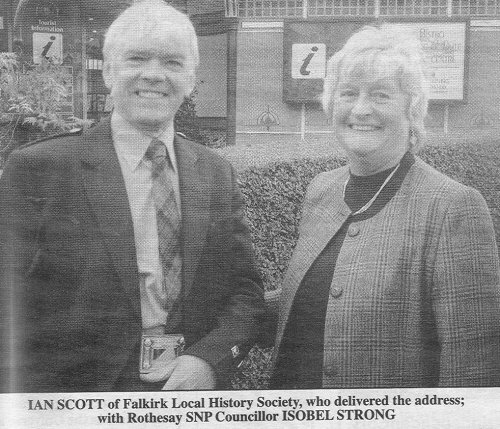 Councillor Maclntyre then went on to praise the memory of Sir John Stewart and his gallant men from the lands of Bute, who fell to a man at the Battle of Falkirk in 1298. He gave thanks also to the Men of Bute Commemoration Group, remembering Lexie Montgomery who had died earlier in the year. Piper Ross Hunter played "The Battle of Falkirk 1298" before guest speaker for the day, Ian Scott of the Falkirk Local History Society gave the address; telling how the Men of Bute had journeyed to Falkirk to join William Wallace and others in fighting against King Edward and his invading English army. Ian Scott paid tribute to the courage, duty and loyalty of Sir John Stewart and his men. He reminded us that they could have retreated from the battlefield as others had done, but chose instead to stand to a man to protect their country and leader. Mrs Aileen Samuel and her granddaughter Marcella then unveiled the memorial stone to rapturous applause from the crowd of onlookers who numbered just over 200. Councillor Isobel Strong presented Mrs Samuel with a bouquet of flowers and following this, several wreaths were laid including those from the people of Bute, Knights Templars, the Society of William Wallace and Argyll & Bute District Council. Personal floral tributes were also laid. The Rev lain Goring dedicated the Memorial Stone followed by "The Flowers o the Forest" lament and a minute’s silence. Robert Maclntyre gave his closing remarks before inviting Canon lain MacMaster to offer a short prayer in Latin and, finally, a Gaelic blessing. Proceedings were brought to an end with "ScotsWha Hae", sung by stonemason Andrew Wilson and his wife Mabel with the assembled crowd joining in. 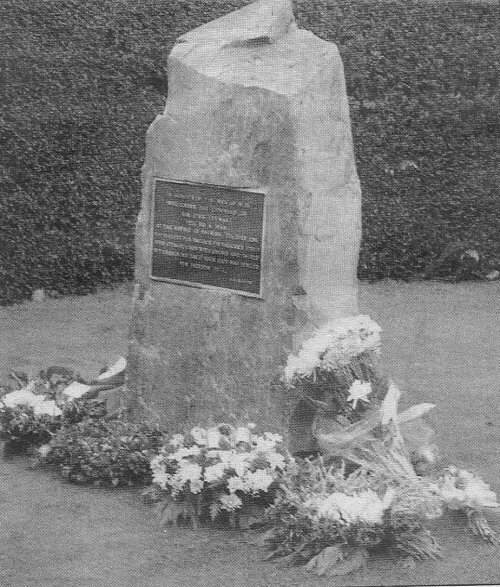 Before going off to the adjoining bistro in the Discovery Centre to celebrate, many photographs were taken of the Memorial and its inscription. Alastair McMillan whose verse appears on the plaque, toasted the memory of William Wallace, Sir John Stewart and the Men of Bute before christening the Stone with the remainder of the whisky! And thy streams are deep ting'd with the blood of the slain. My poor bleeding country, what more can I do? Farewell ye dear partners of peril! Farewell! And your names be enrolled with the sons of the brave. Ah! woe to the hour when they Wallace must fly. Sadly, the Rev Ronnie Samuel, whose wife Aileen unveiled the stone, died shortly before Christmas. The remaining Men of Bute Commemoration Group are grateful to Lexie and Ronnie for their enthusiasm and support shown in this project. We now continue with an educational programme to include distribution of 5,000 leaflets throughout Argyll & Bute region. We also hope to put forward an annual prize aimed at secondary school children on Bute, to promote and enhance their awareness of the gallant Men of Bute and their part in the Battle of Falkirk 1298.